Though the identity of this English gentlewoman has traditionally passed down the centuries as ‘Lady Mary Parker, née Senhouse’, in fact Mary Senhouse never married. 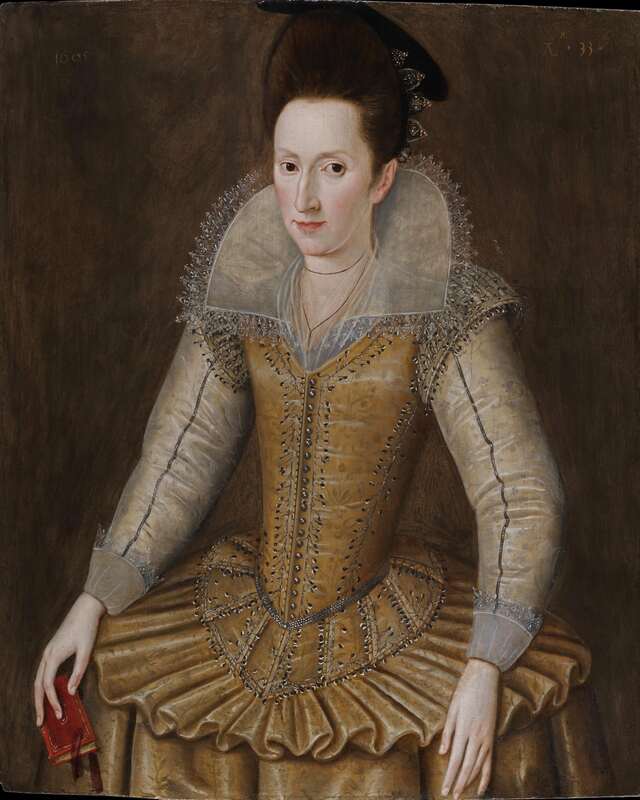 She is depicted wearing a striking buff coloured satin dress with elaborate silver embroidery, buttons and spangles, though perhaps the conspicuous lack of jewellery may reflect her unmarried status. thence acquired c. 1980s by Mary Burkett OBE (1924 – 2014), Isel Hall, until 2014. The attribution to Robert Peake, confirmed by Sir Roy Strong, is based on stylistic grounds as well as the distinctive script used for the inscriptions. Peake trained as a goldsmith but became one of the first native English portrait painters to achieve particular renown in his day, enjoying particular success a court painter during the reign of James I. By 1605, the date of our portrait, he had a thriving London workshop, and in June 1607 he joined the Flemish-born artist John de Critz as ‘Serjeant-Painter’ to the king. One wonders why an unmarried gentlewoman from Cumbria was painted by Peake in the first place – who at the time had an illustrious roll-call of patrons, and as far as we know only ever painted from his studio in London. One possible explanation is that Mary may have kept house for her chaplain brother, Richard Senhouse (d. 1626), who himself moved in elite circles, becoming chaplain successively to Edward Russell, 3rd Earl of Bedford, Prince Charles and King James I. The painting comes from a country house in Cumbria, Isel Hall, where it is thought to have hung from when it was first painted, until at least the early 20th century. The portrait was reacquired for Isel Hall in the 1980s by Mary Burkett (1924 – 2014), former director of Abbot Hall Art Gallery in Kendall. She had been working on a catalogue of all the portraits in Cumbria at the time she was bequeathed the property in the mid-1980s, and set about buying back works that had historic connections to the house. In a rather wonderfully titled book by William Hutchinson (1732 – 1814), from 1794, ‘The history of the county of Cumberland, and some places adjacent, from the earliest accounts to the present time: comprehending the local history of the county; its antiquities, the origin, genealogy, and present state of the principal families, with biographical notes; its mines, minerals, and plants, with other curiosities, either of nature or of art…’, Isel Hall was noted under the parish of Isel’s ‘antiquities and curiosities’, in which ‘There are several good portraits of the family in the house…’. Little is known of the sitter other than her traditional identification as ‘Lady Mary Parker, née Senhouse’. This appears to have been a hybrid identification, muddled over time through the family’s subsequent generations; the Mary Senhouse whose dates fit with our sitter never married, (though there was a Mary Parker, née Senhouse who married in 1819). The Senhouses were a prominent Cumbrian family and Lords of the Manor of Ellenborough (also known as Alnborough). Mary was the twelfth child (of fourteen) of John Senhouse (c. 1540 – 1604), of Netherhall, and Anne Ponsonby of Haile Hall, Haile, Cumberland. Here, aged thirty-three, Mary wears a black cap and mourning thread around her neck. These were most likely in remembrance of her recently deceased father. Her sumptuous buff coloured dress is enough to tell us this is not a portrait of a widow, as for example, in Marcus Gheeraerts’s portrait of Elizabeth Finch in widow’s weeds (painted 1600, private collection). The full attribution of our portrait to Robert Peake, confirmed by Sir Roy Strong, is based upon the distinctive marking above the inscribed aged of the sitter at top right. In 1969 Roy Strong counted nineteen portraits bearing the artist’s inscription. The sitter too, has a rather elongated Peake-like face, with a typical distinctly modelled mouth and eyelids. There is, however, a strong stylistic resemblance between this painting and a number of works by his fellow artist John de Critz the Elder (1555 – 1641). Most strikingly, De Critz’s contemporaneous portrait of Anne of Denmark of c. 1605, (collection of the Earl of Haddington), bears an identical pose, with similar hand gestures, hair style and even certain aspects of costume. Specifically, both this and De Critz’s portraits have the fourth finger on the left hand tucked behind the middle finger. Though this type of gestural delicacy is common to noble sitters of the period, this specific link between two female sitters painted in the same year – one by De Critz and ours, by Peake - may suggest an intimate exchange of figural style. In any case, the placement of hands in the Anne of Denmark is of such importance that it was on this basis that Roy Strong attributed several other works to the artist. Along with the portrait of Sir John Puckering by an Anonymous follower of Hieronimo Custodis (currently also with The Weiss Gallery). During her long career, Mary Burkett wrote twelve biographies, expanded greatly the collections of the insititutions in which she was involved, and championed many local artists. Her correspondence was notable, including Percy Kelly, and even Stalin’s daughter Svetlana Alliluyeva (1926 – 2011). John Senhouse was a keen amateur antiquarian, collecting inscribed stones from the Roman fort and civilian town lying along the coastal ridge above the Manor House, and as was the practice at that time, set them within the family mansion. Today the house is home to the Senhouse Roman Museum. Formerly among the Lenthall pictures at Burford Priory. Roy Strong, The English Icon: Elizabethan & Jacobean Portraiture, 1969, London, p. 225. See E. Town, A Biographical Dictionary of London Painters, 1547 – 1625, The Walpole Society, 2014, vol. 66, p. 68.